The “World Guy,” Erik Bendl, reunites with his dog, Nice, the day after Nice underwent knee surgery. 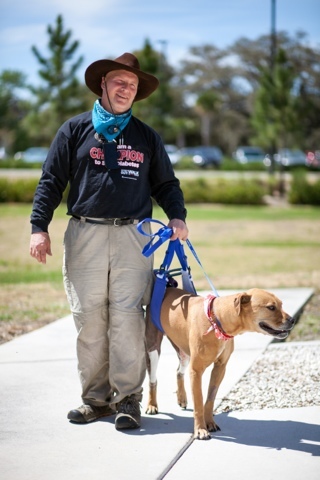 For Erik Bendl, known as “World Guy” for his countrywide treks pushing a canvas globe to promote diabetes awareness, the world’s weight got a little lighter after his dog, Nice, underwent knee surgery at the University of Florida Small Animal Hospital on March 19. Nice, a 6-year-old blackmouth cur mix, was discharged yesterday. “We think there’s a good chance Nice will make a full recovery over the next few months and be off to his long walks again,” said Caleb Hudson, D.V.M., a veterinary surgeon at UF who performed Nice’s 2 1/2-hour operation. Bendl began walking with a mission — to promote diabetes awareness — after his mother, a former Kentucky alderman and state representative, died at 54 of complications from the disease. He has walked more than 6,000 miles in 41 states, in all kinds of weather, sharing his story and his motivational message — that diabetes doesn’t have to be a death sentence. In many cases, it can be prevented through weight loss and exercise and that people should “love themselves and take a walk.” For the past six years, Nice has walked with him, a part of his life and his mission. Nice began limping in Florida during Bendl’s latest journey, which began in Pensacola and was to end in Tampa. After getting caught in a storm, he hunkered down in Spring Hill, where a local business owner offered shelter. Nice’s limping became worse. He saw a veterinarian in the area, who suspected a problem involving either Nice’s hip or knee joints. 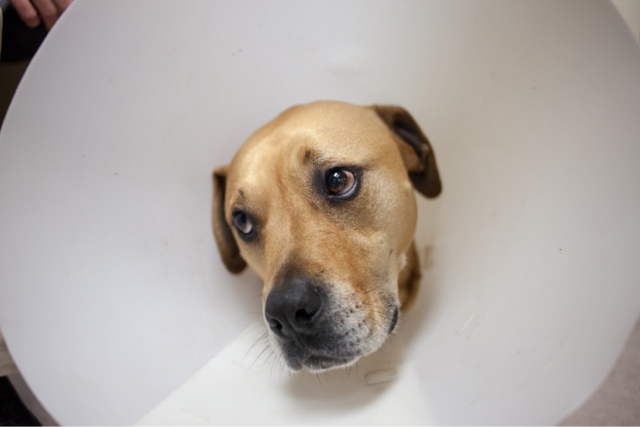 Bendl sought a second opinion from veterinary specialists at the University of Florida. When Bendl arrived at UF on March 4, he wasn’t pushing the huge blue-and-green painted globe he’s usually seen with in photos. That was out in the parking lot in his weathered purple van, although he did offer to inflate the world for the staff’s amusement. With his wide smile, colorful stories and self-deprecating humor, Bendl did his best to remain positive while an orthopedic surgeon examined Nice and performed tests. But by day’s end, Bendl’s heart was heavy. “I didn’t expect that Nice’s problems would be this severe or this expensive to deal with,” he said. Nice was diagnosed as having torn cranial cruciate ligaments in both knees, requiring surgery to correct the problems. Two tibial plateau leveling osteotomy surgeries performed simultaneously are more economical than operating on one leg at a time, surgeons said, but the cost still was estimated at approximately $5,000. UF was able to subsidize part of the cost through its Pet Samaritan Fund, but Erik still had to come up with around $3,400 to cover the procedures and postoperative X-rays. The doctor recommended that the UF surgery team operate as soon as possible to have the best chance of a good outcome. For a man with no credit and no regular income — Bendl supports himself and Nice through the support of friends, family members and strangers — the figure and the time frame were daunting. Overwhelmed, Bendl headed back to Spring Hill to mull his options. 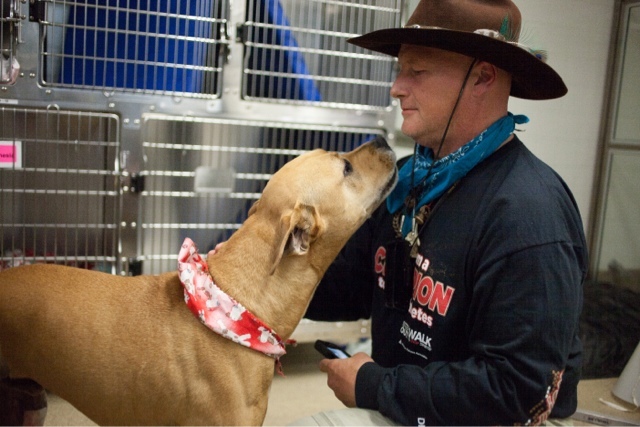 The next morning, the 50-year-old Kentucky native was resolute — he’d do whatever he could to help his dog, relying on the resources at hand: his World Guy blog, his friends and his personal and public Facebook pages. Bendl said he’s better at telling stories and encouraging people to stay healthy than he is at asking for help. But Nice’s story, as they say, had legs. Thanks to media stories and social media, within 10 days enough funds had been collected to cover Nice’s surgery and most of his postoperative tests. Bendl said he was humbled and grateful for every donation, no matter how small, but two couples in particular stood out in their generosity. An elderly Spring Hill couple had been in the process of closing four booths they operated at the local flea market. Instead of storing their inventory, they decided to donate it all to Bendl after reading about Nice in the local paper. The proceeds gave Bendl $560 more to put toward Nice’s care. Another couple, owners of a tattoo store in Arkansas, had met Erik and Nice on the road and read about their plight on Bendl’s World Guy blog. They gave $500, which put him over what was needed to schedule the surgery. But more than that, Bendl said, they told him that his encouragement to “get healthy” had prompted both of them to take better care of themselves. To him, that meant the most. Bendl and Nice will be back at UF in a few weeks for follow-up X-rays to ensure the dog’s legs are healing properly. During the three-month recuperation period, the two will lay low and take things as they come, Bendl said.